Elena Solodow at the You're Write. Except when you're Rong. blog is doing a blogfest titled "100 Words for $100 Blogfest," so I figured I'd give it a shot and encourage others to participate. The monetary prize is actually based on how many people enter, so it won't reach $100 until 100 people enter their sentence. Basically, participants are asked to write a sentence at 100 words with a five-word leeway and use only one semicolon. 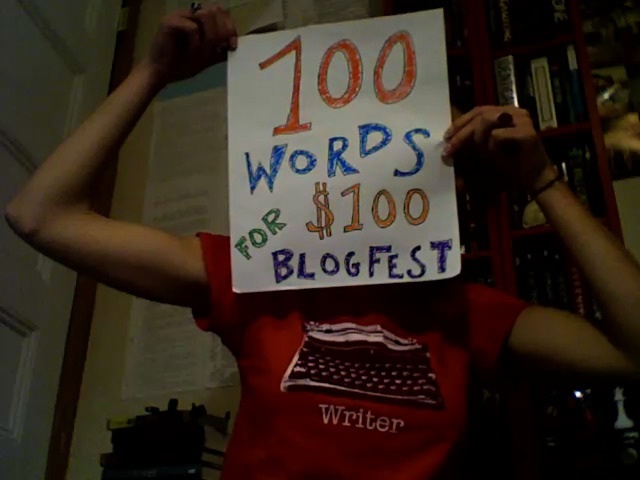 Elena Solodow holds up a poster promoting the blogfest. For my entry, I wanted to write it as a very short stand-alone story. I also didn't want a read-it-all-in-one-breath sentence, so I made use of a semicolon and used em dashes and commas to break it up; however, I wanted a longer breath near the end to make the last break stand out as some sort of epiphany. Once a thing of science fiction, holograms are gaining attention. I noticed a video on The League of Extraordinary Writers' blog entry titled Holograms - reach out and touch the future! that amazed me. It was a live concert with an anime/manga-styled character performing in 3D. Pop star Hatsume Miku is actually a projection onto a translucent screen singing, which makes the hologram illusion. Even her voice isn't real. Rather, her voice is synthesized from various voice samples through Vocaloid software to sing this "World is Mine" song. It's not the first time there's been a 3D character singer playing live. The band Gorillaz did something similar, but the image was projected on a back screen using the Musion Eyeliner technology, and the voice was real. Oh, and excuse the interrobang (‽). Do you know who James Gunn is? Have you ever heard of the Center for the Study of Science Fiction? If you don't, not to worry; I'm going to put Gunn and the center in the spotlight and give you some background. Gunn is the director of the center at the University of Kansas and professor emeritus of English at the university. He's the editor of the The Road to Science Fiction series and has a Hugo award for Isaac Asimov: The Foundations of Science Fiction , a nonfiction book published in 1983. His science fiction includes The Immortals and almost a hundred other stories. Plus, he was named Grand Master of Science Fiction in 2007 by the Science Fiction and Fantasy Writers of America. Now that you know who Gunn is if you didn't already, what is the Center for the Study of Science Fiction? Basically, it's a not-for-profit organization created in 1982 with the goals to educate people in science fiction and garner more interest in the genre. It's known for presenting the John W. Campbell Memorial Award for the best science-fiction novel and has an intensive writer's workshop. On its website, you'll find links to several resources. You also can earn college-credit taking science fiction courses it offers through the University of Kansas. I recommend you read some of Gunn's works and check out the Center for the Study of Science Fiction website at www2.ku.edu/~sfcenter. It's always good to learn something new. First, I'd like to thank Vicki Rocho at Rambles and Randomness blog for hosting the Eye Candy Blogfest and picking my favorite picture as the winner. As I was looking at everyone's entries, I notice a Death Melon picture at the Willy Wonka Experience blog. basically, it's a melon designed like the Death Star from Star Wars. It reminded me of a video from YouTube called Grocery Store Wars, which you can watch below. And since I'm on the subject of produce, there's another good fan-made Star Wars video called Chad Vader, in which Vader works at a grocery store. As a side note, Matt Sloan who does the voice of Vader in the video was so good at it that he did the voice of Vader for the "Star Wars: The Force Unleashed" video games. It's a new year, which means new goals. I thought about blogging about my goals for the year, but I can sum that up by saying I want to read, write, watch and listen to more science fiction stories and share it with others. Alternatively, I could have written a book review of an old, little-known novel I read (which I still may blog about). Or I could have shared a 300-word story I wrote (my first attempt at writing flash fiction). Ultimately, I decided to participate in Vicki Rocho's Eye Candy Blogfest from her Rambles & Randomness blog. I found out about it from Alex J. Cavanaugh's blog.